There is perhaps no other post-911 terroristic event that better exemplifies the dangers of homegrown radical violence than the events of 7/7 – the cold-heartedly planned series of explosions that claimed 52 lives in London, UK on July 7, 2005. Like the 2004 bombings in Madrid, Spain, the carefully orchestrated atrocity occurred during the early morning rush hour, as those affected were making their way to work by means of mass transit. Coming just one day after the city had been awarded the 2012 Summer Olympics, 3 bombs exploded on sub-surface underground train cars – and a fourth detonated on the top deck of a city double-decker bus later that morning. As is usually the case with terroristic violence, the victims died arbitrarily – and came from diverse backgrounds, ranging in ages from 20 to 60. Unsuspecting and innocent, they included native-born citizens of the UK, a married couple of 14 years, foreign exchange students, foreign-born British nationals, an aspiring actress and writer, and a Vietnamese-born computer worker who died one week later. A noted city of multiculturalism, the London citizens and visitors who perished that day were very representative of that fact – making the underlying hatred in the explosions even more vicious and senseless. Random and lethal, that is the face of transnational radical killing when it strikes. Each of the four explosions of 7/7 were detonated through acts of suicide, and in each case the terrorists utilized homemade bombs that had been constructed in a London area apartment, utilizing a highly volatile organic peroxide–based mixture. Not only were the bombs homemade, but three of the terrorists were “homegrown” citizens of the UK – whereas the fourth was a British resident and Jamaican convert to Islamic extremism. As also demonstrated with the Boston Marathon bombing, the explosive devices were taken to the location of detonation in a backpack by young men who had previously led rather ordinary lives – although each of them was callously motivated by religious ideology. Although there is no evidence directly linking the events of 7/7 to al-Qaeda, each of the four perpetrators was drawn strongly to the violent beliefs of that organization – even to the point of being expelled from school for distributing promotional leaflets. In another similarity with the bombing of the Boston Marathon, 2 of the terrorists had just completed a trip to Pakistan in the year prior to the attacks. Subsequent investigation revealed that all four of the suicide bombers seemed to have been self-radicalized and dedicated to a violent interpretation of Islamic faith that was carried out in a deadly fashion. Videos of the perpetrators appeared later on the Arabic television channel Al-Jazeera, espousing religious fervor as the motive for the suicidal havoc they leveled on unsuspecting and innocent citizens of London that day. The oldest and suspected leader of the group addressed the camera, stating that “words have no impact upon you, therefore I’m going to talk to you in a language that you understand.” His message also made reference to years of atrocities that have been committed against the Muslim world by Western democracies such as Great Britain, necessitating “ethical stances” on their part. “We are at war,” he concluded, “and I am a soldier. Now you too will taste the reality of this situation.” There was no doubt in his words that he intended to die as a martyr, fervently beseeching “Allah almighty to accept the work from me and my brothers and enter us into gardens of paradise.” During the video, he invoked the names of prominent al-Qaeda leaders, including Osama Bin Laden. 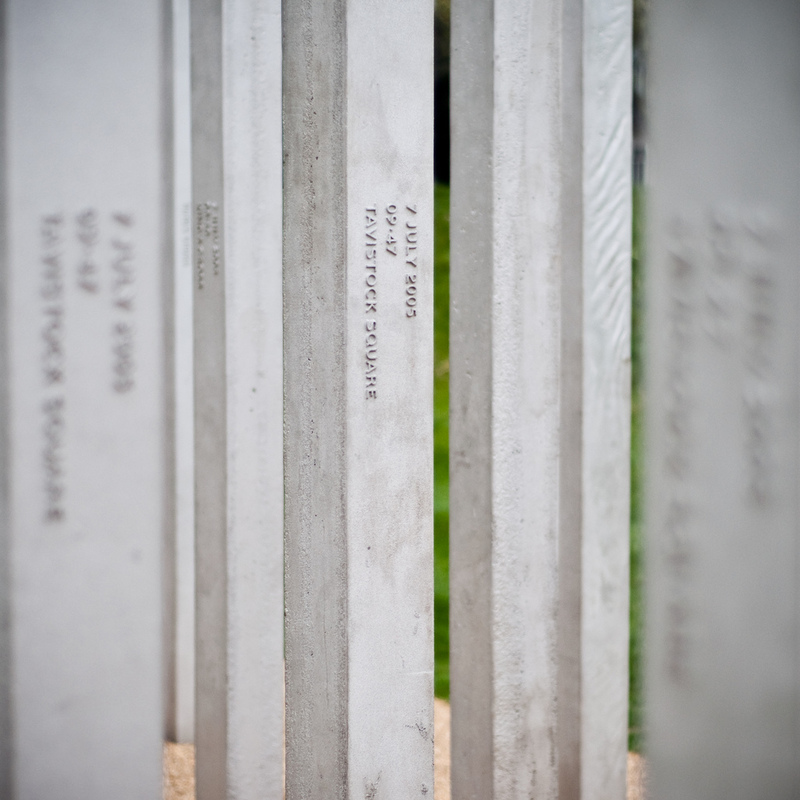 Located in the southeast corner of Hyde Park, the memorial recognizing the 52 victims of 7/7 was officially dedicated by the Prince of Wales and the Duchess of Cornwall on the fourth anniversary of the tragedy in 2009, at a ceremony attended by key political figures and surviving family members. Consisting of 52 stainless steel pillars rising straight up from the ground, the monument was designed under the close advisement of the bereaved families. 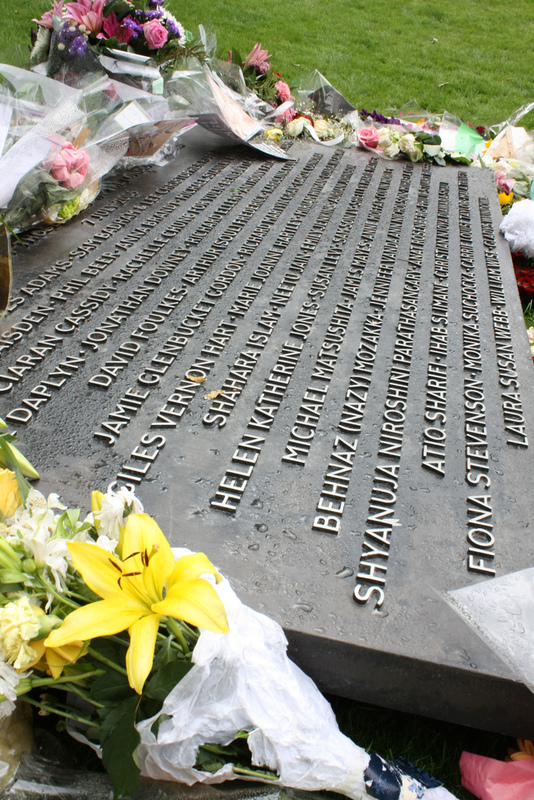 Organized into four interconnecting clusters that represent the four locations of the incident, visitors to the site can walk through the pillars and read a variety of inscriptions related to the bombing – and a stainless steel plaque lists the names of those who perished is located close by. Although cast from long-lasting, stainless steel, the memorial has recently received attention for the removal of a rust-colored film that developed on the rougher surfaces of some pillars. 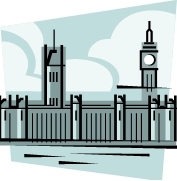 Nevertheless, the memorial is well taken care of like all the monuments of the Royal Parks in the UK, and it was the site of a ceremony marking the eighth anniversary of the bombings on July 7, 2013. Over the years since the bombing of the USS Cole, experts have carefully examined the role of “self-radicalization” evident in the continued prevalence of violent Islamic extremism – involving young Muslims that are “so enamored with al-Qaeda’s poisonous narrative that they are determined to commit spectacular violence in the name of Allah.” Although one might suspect emotional and mental problems, experts such as Brian Michael Jenkins mention that there is no cut and dried psychological profile for Islamist extremism. In fact, the conclusion has been that each such terrorist has been “remarkably ordinary.” However, the same research has uncovered a common thread in the motivation of self-radicalized terrorists, characterized by a desire to inflict glorified damage on an enemy as part of a religious war. Nevertheless, religious fervor is not the real heart of their inspiration, but rather a desire to vent anger and inflict “collective revenge” as part of an epic battle. Jenkins points out that “for a lot of these young men, the ideology has become a conveyor of individual discontent. Terrorism has become a solution to an unsatisfactory life.” This presents all the more need to promote religious and cultural tolerance as a means of lessening the allure of terrorism to some young men. It is also a call to sign the petition to which this website is dedicated. Join us by clicking the link below. This entry was posted in Posts for the Cause and tagged 7/7, islamist extremism, London, monuments to victims of terrorism, peace, religious tolerance, self-radicalized, terroristic violence. Bookmark the permalink.